Cut 5 peaches in half and remove pits. Blend to make 2 cups of puree. Mix 1 cup of the puree with 1 tablespoon of lemon juice. Refrigerate. Combine remaining peach puree with the remaining lemon juice, soy sauce, honey, minced garlic, ginger, and pepper. Pour over meat and marinate in a non-reactive container or large sealed plastic bag in the refrigerator for 3 hours or more, turning occasionally. Drain and reserve marinade. 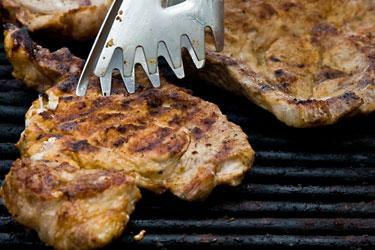 Cook meat on a spit over low coals for about 3 hours, basting often with marinade. Cut the remaining peaches in half and remove pits. About 30 to 40 minutes before the roast is done, place the peach halves on a double thickness of foil under the roast. Brush with marinade and serve as a garnish surrounding the roast. Heat the refrigerated peach mixture with the marinade to serve with the roast.